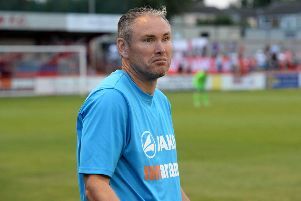 Banbury United manager Mike Ford will be hoping home advantage will help his side knock Hungerford Town out of the FA Trophy at the second attempt on Tuesday. The Puritans drew 0-0 in Saturday’s first qualifying round tie at the Evo-Stik Southern League premier division outfit and the winners of Tuesday’s replay willl be away to St Neots Town. Hungerford dominated the early stages, Charlie Wise headed a goalbound effort off the line but United defended well against what was at times a relentless tide. United worked their way into the tie and went close when a neat free-kick routine between Zac McEachran and Darius Browne whose dangerous cross wasn’t converted. Hungerford regained the upper hand and in the final minute of the first half James Rusby was denied by the woodwork. After the restart Rusby shot just wide but United had a penalty appeal waved away when Leam Howards was brought down. As the game progressed United looked the more likely to break the deadlock and Howards put Louis Joyce through but he miskicked with just Paul Strudley to beat. McEachran’s excellent shot from 30 yards had too much sting for Strudley but the Hungerford keeper gathered at the second attempt. There were a couple of scares for United in the final few minutes but they held on to earn a second chance at Spencer Stadium on Tuesday night.